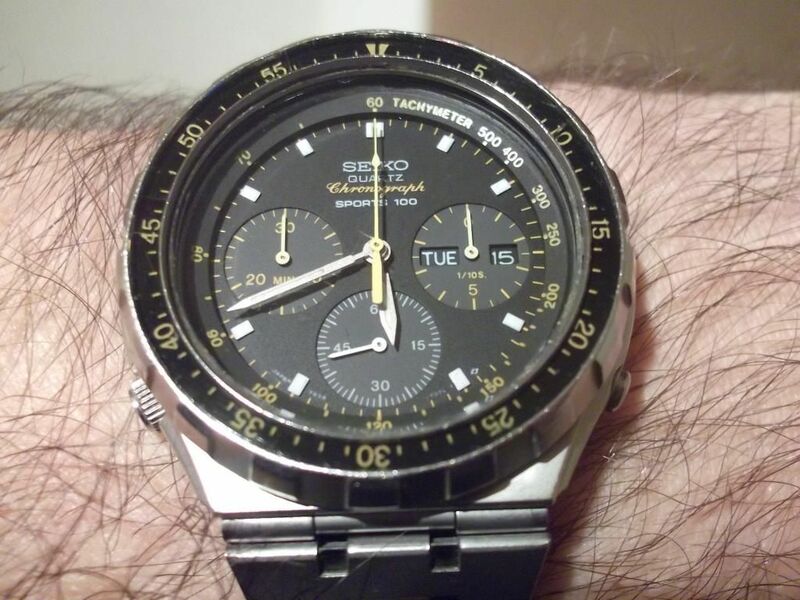 Woody's topic originally titled: Seiko 7A38-705A is this a hard to find watch ? It's my first post (now moved to this section). 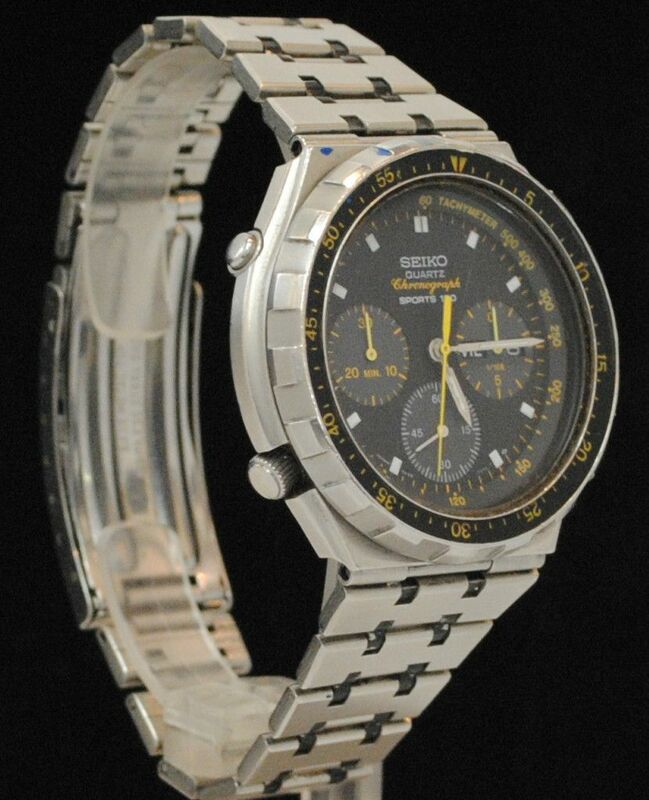 Hi just got hold of a Seiko 7A38-705A looks like the Seiko 7A38-7050 I think but the bezel and hands are a not the same colour. Not got it yet so no photos, will post as soon as it comes. Had a bit of a look on the net I think it may be not so easy to find 7A38? If I am wrong I may have paid too much. 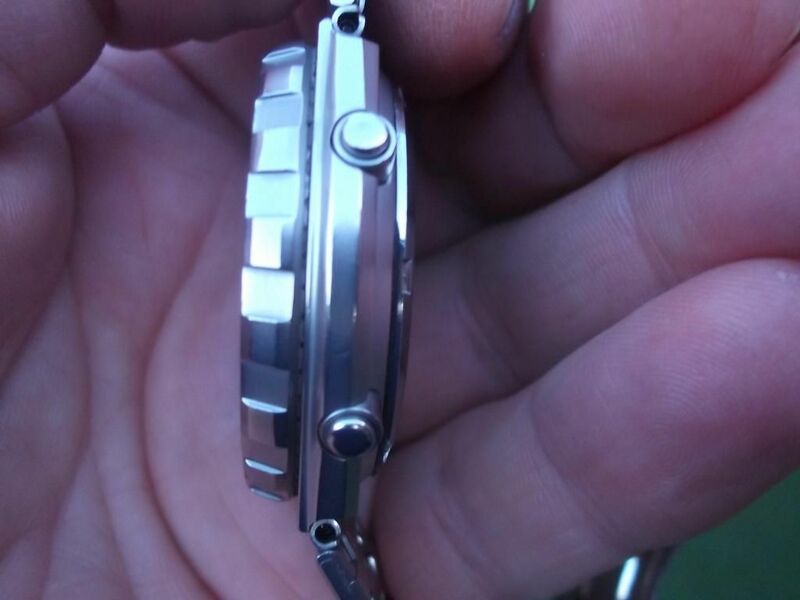 Looks like its got the right bracelet on as well got some black bits in the links that are not mint, it's been used so its not mint but from what I could see on the photos looks not too bad. Anyway hi to you all. All the best Woody. You are correct in your assumptions. 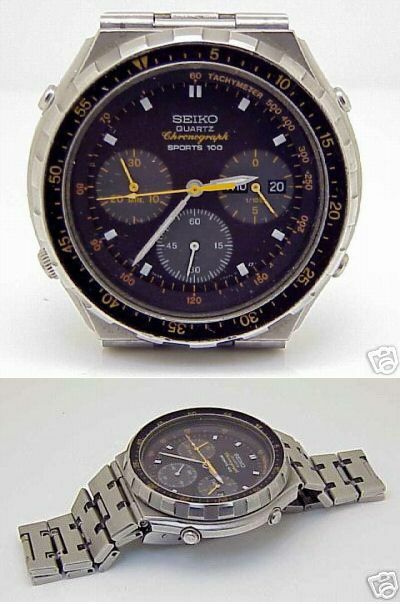 Yes, the 7A38-705A is comparatively rare and it is effectively the sister watch to the 7A38-7050. 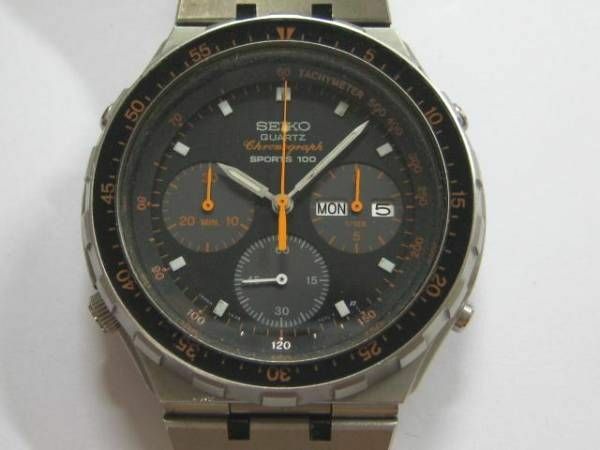 It shares many common parts, but has orange bezel numbering, dial printing and chronograph hands, instead of peppermint green. There is another subtle difference between them; their dials. 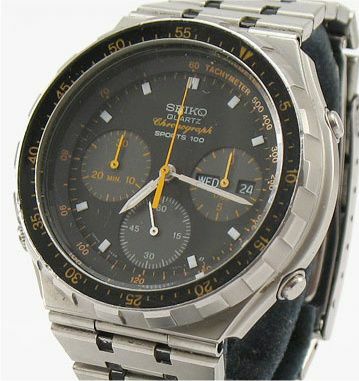 The 7A38-705A has a black dial with dark grey sub-dials, whereas in the 7A38-7050 the main dial plate colours are reversed - that has a dark grey dial with black sub-dials. 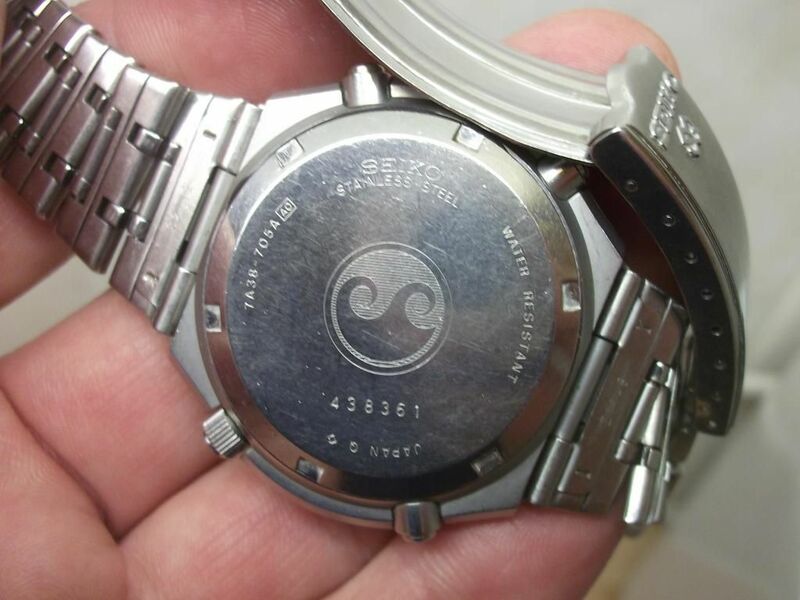 Apart from the black paint wearing off the small bracelet joining links (which also seem prone to stretching) the other problem that 7A38-705A's appear to suffer from is fading of the bezel lettering, dial printing and hands. I've probably seen more examples with (faded) yellow printing and hands than I have with orange. In contrast, the peppermint green of the 7A38-7050 is more durable. 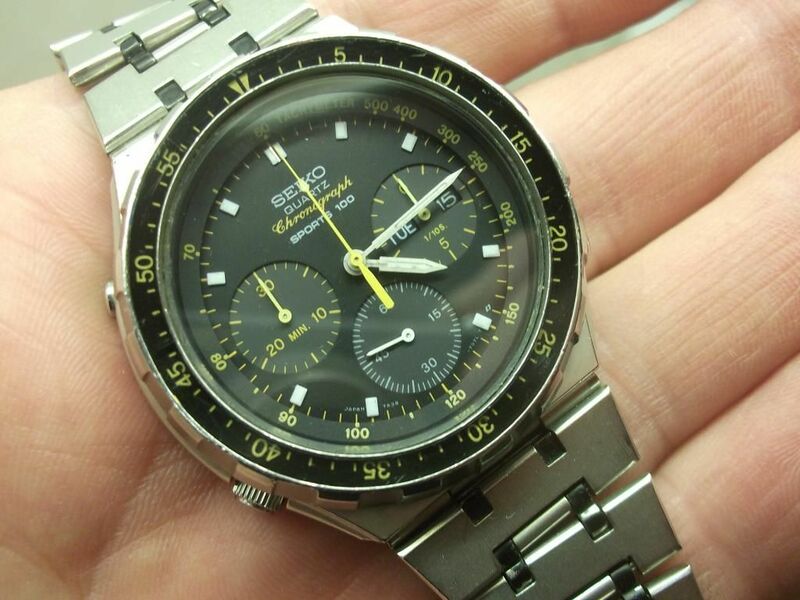 However, although the bezel, case, bracelet, dial printing and hands may be the best condition I've seen, this watch wasn't completely original. Note the black (printed) on white (background) day and date wheels. 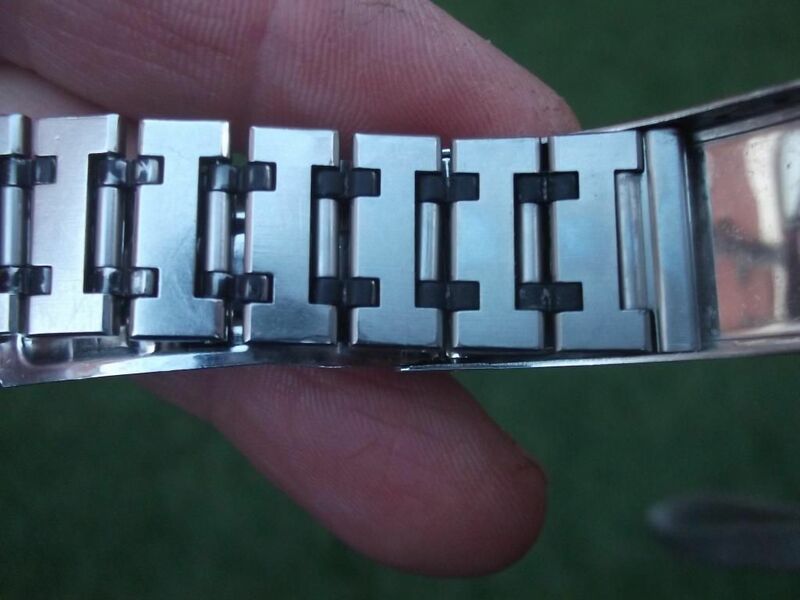 It's obviously been fitted with a replacement movement. 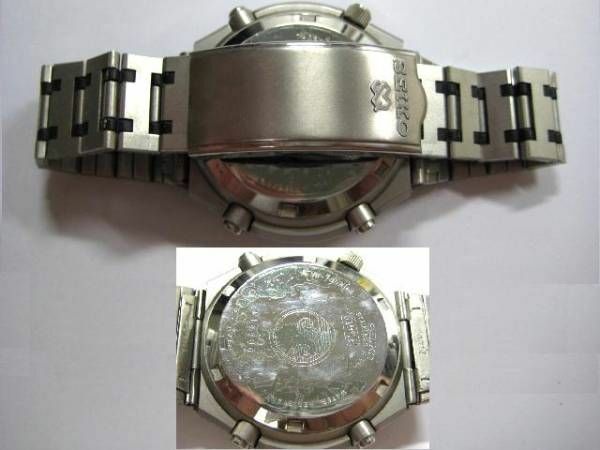 Hi Paul thank you for your help, I knew would know what was with the watch. 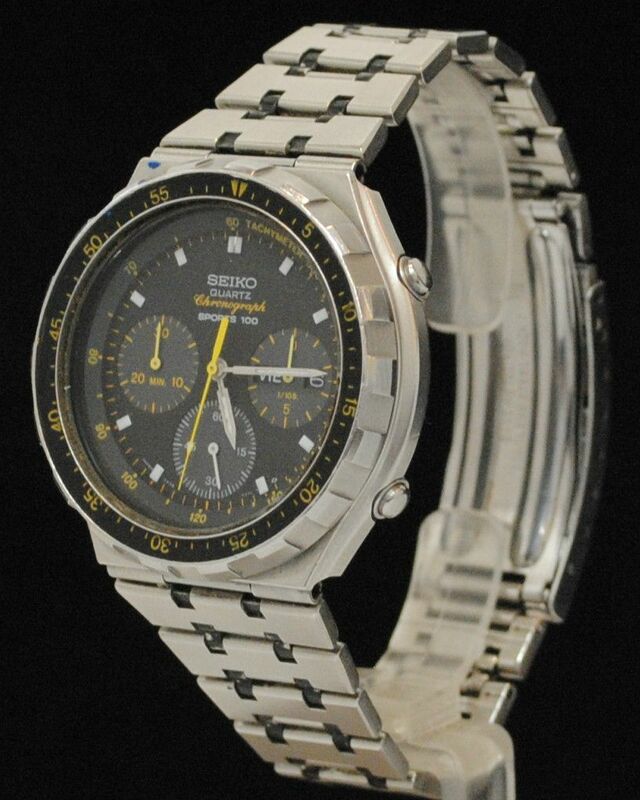 I paid more than £115 so maybe I paid too much, just that these days I like to have some watches you don't see much. Still not sure where I'm going watch wise, got way too many and am trying to move some on this year. I missed you on RLT, as your post were good IMHO. Anyway I hope when the watch comes it a good one. Thank you very much. Woody. Ian (Woody). 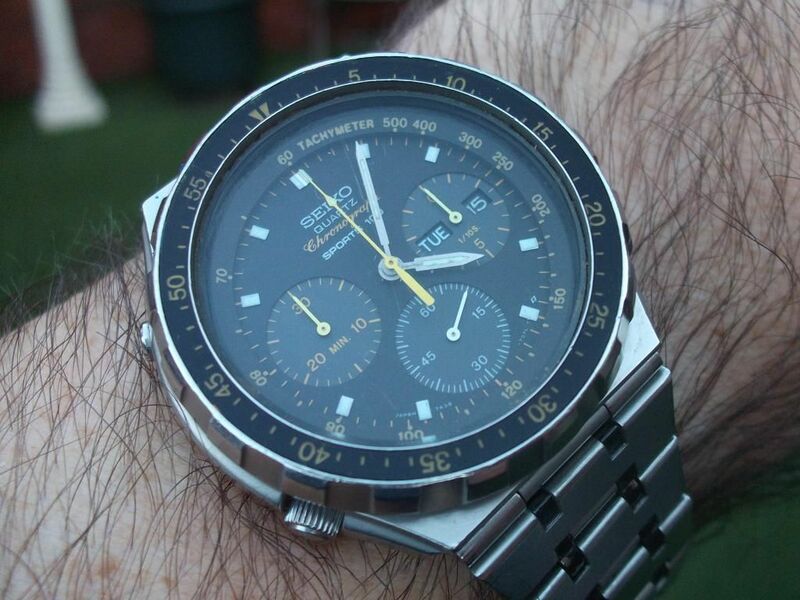 That 7A38-705A which sold (fairly quickly) on TZ-UK for £115 was over 5 years ago. Prices for all 7A38's - particularly examples of rarer models in good condition have increased somewhat since then. Probably due to (for the main part) my own fault for publicizing them - particularly in the various threads on RLT from 2009 - 2011. We'll look forward to seeing your photos of the 7A38-705A when it arrives. hi thats the one i can do links yet .its the post cost of £40.00 and i know i am going to get done for import tax as well .the last three high cost ones i got done on from the usa so i do not buy much now from there just like the look of this one .what do you think it looks like hes a good ebayer has good feedback ,and selling some good stuff by the looks of it.all the best woody. Ian. I'd say it's a pretty good looking honest used example of a 7A38-705A. 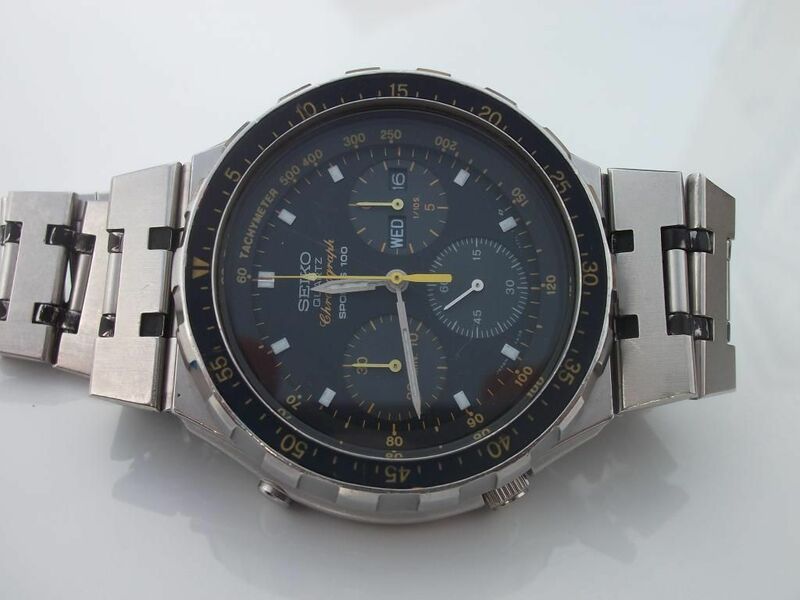 Going by the seller's photos, there's obviously some fading of the bezel and dial lettering - most noticeably of the chrono' hands: the subdial hands have faded much lighter than the sweep hand. 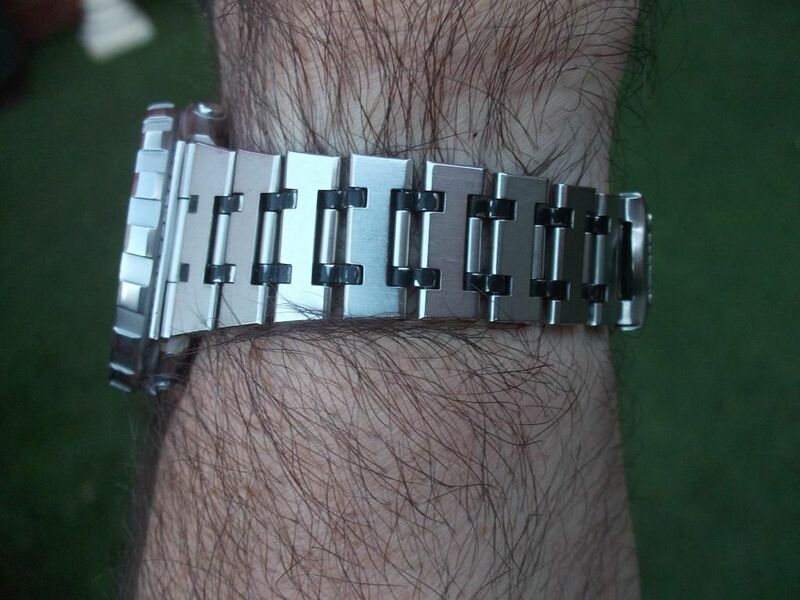 As you mentioned, there's some paint missing from the bracelet's small interconnecting links. That's quite normal and I've seen a lot worse. 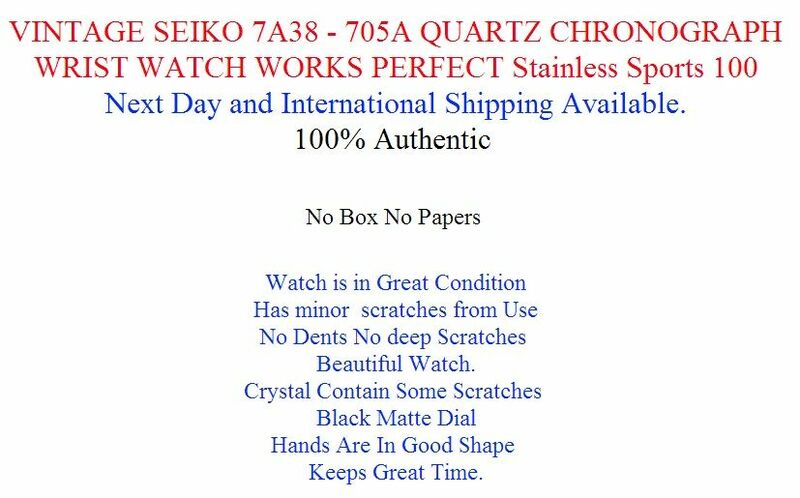 I suspect that there's also some stretch between the links, if what the seller says about it being able to fit an 8¾" wrist is true. But other than that you snagged it for a good price - apart from the $60 shipping and 20% VAT which will negate that to some extent. hi paul can you put the hands & dial right or would i have have to be new ones and what about bracelets links can thay be done as i have seen what you can do what about geting a new bazel ? .or sould it just be left as it . do you think it would it be worth doing all that work.all the best ian. Personally, I'd say it's best left in exactly the condition it's in, Woody. It's nicely 'aged' so an ideal 'wearer'. Yes, I suppose the missing bits of black paint could be touched up, but they'd soon wear off again as the links rub against each other. 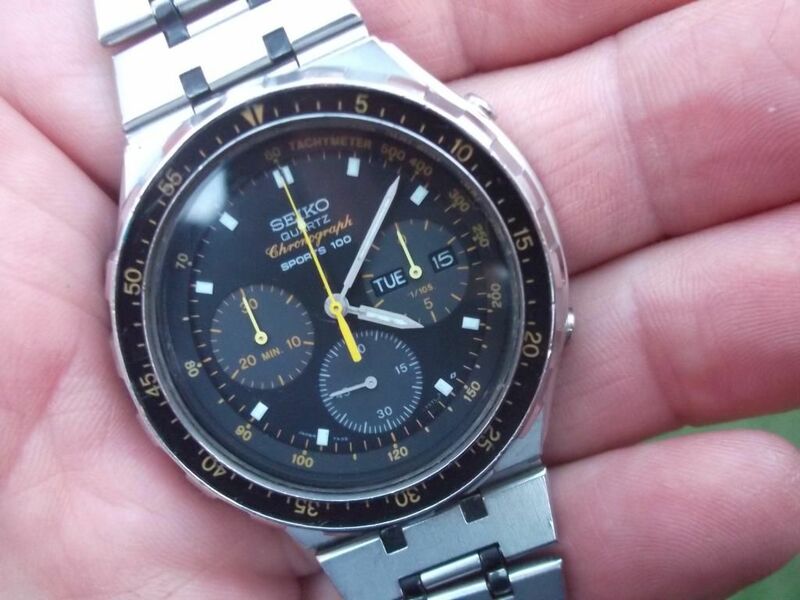 It doesn't need a new bezel, dial or hands IMO; none of them are bad enough to warrant replacing and I suspect the chances of finding NOS parts are slim to Zero. 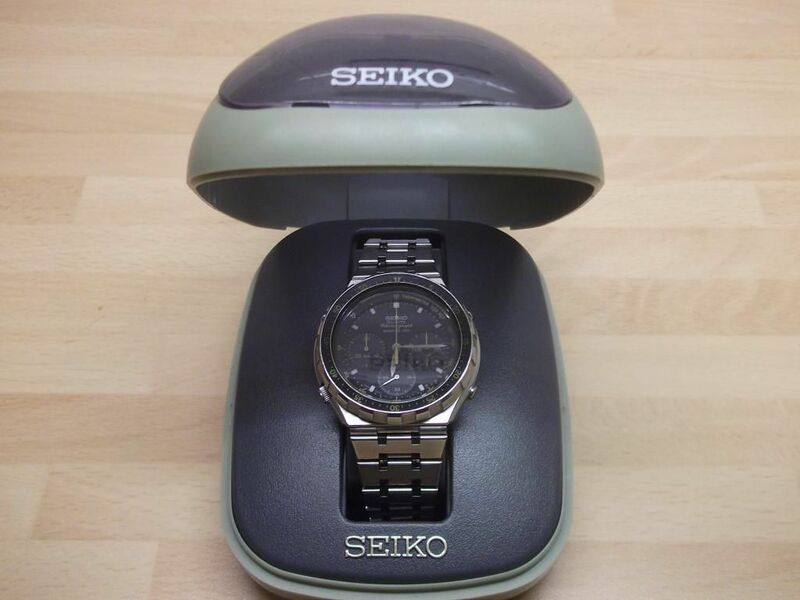 hi well i had to go and pick the watch up from the post office today so thay got me for the vat at £28.03 and £8.00 fee for the post office .also had to pick a box i got for as well .anyway got it home and got it out of the box .loolk nice but had a lot of dna on the braclet case and the bazel would not move ,that too had a lot suff in it in the end i got it to move very nicely did a bit of a clean up of the watch & bracelet looks so much better now.but not good a photo of the dial yet .will try to get a good one on wensday .i have seen some 7a38 with a box like this one so i got it ,but i may not be what it sould have been in.watch seems ok but i would like gone over to make sure all is well.i hope you like it i do and have had on most of the day.all the best woody. 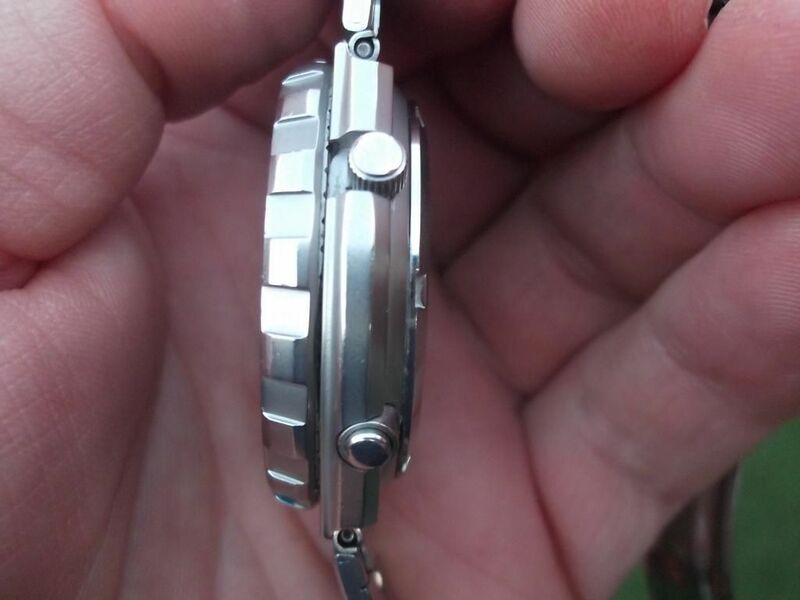 The movement photo looks nice and clean, but ..... the 'finger' over the main chrono hand driving shaft is slightly displaced, so won't be helping. Best to re-seat it correctly. Very nice indeed, Ian. Thanks for sharing your super photos. As I suspected and you've shown in a couple of your photos, there's a bit of stretch in the bracelet, but that's not unusual for this model. 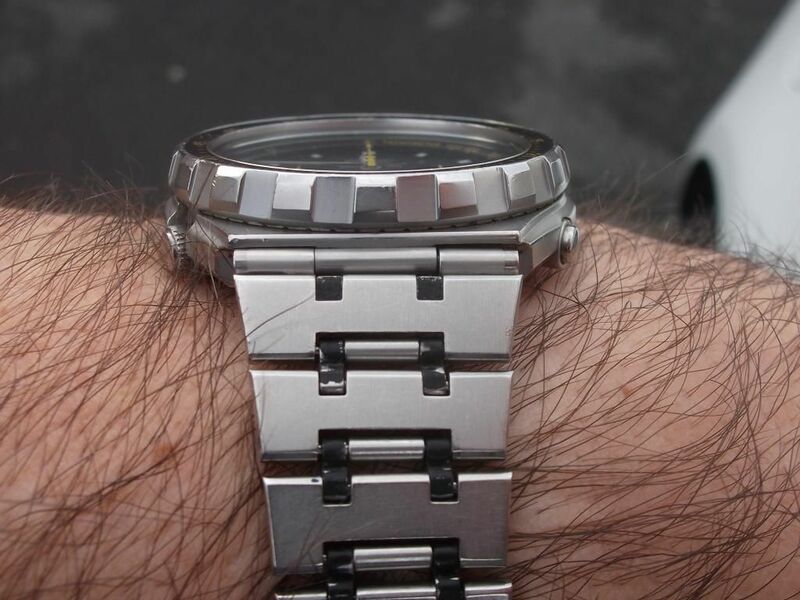 It is possible to carefully pinch up those little black connecting links with a pair of pliers, but with your hairy arms you may want to leave it the way it is. Size: 41.5mm diameter (excluding crown and pushers) x 39.5mm over lug ends x 13mm deep. 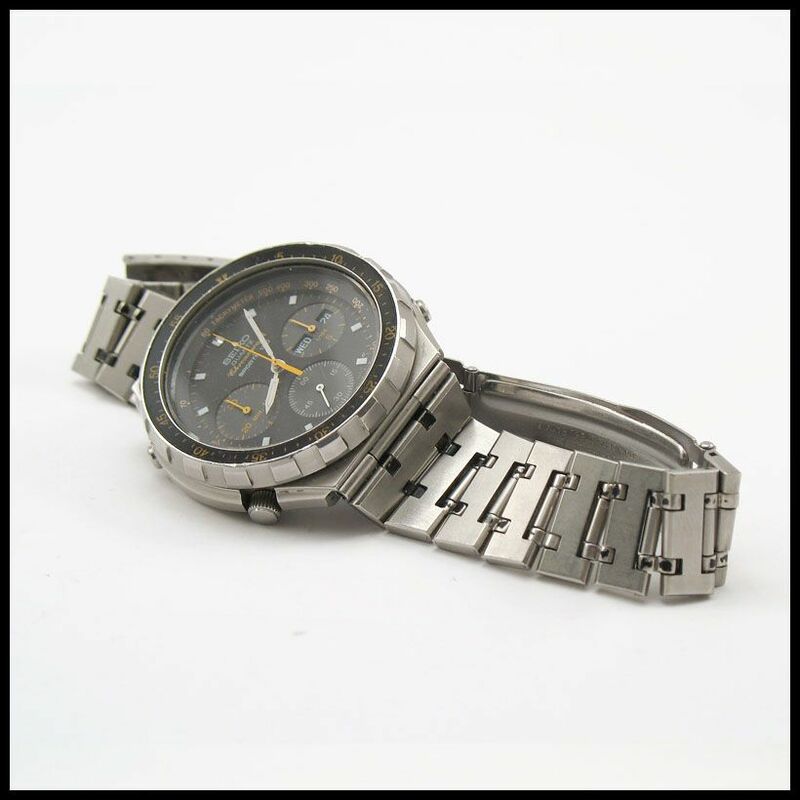 Case material: Stainless Steel - Silver anodized finish. 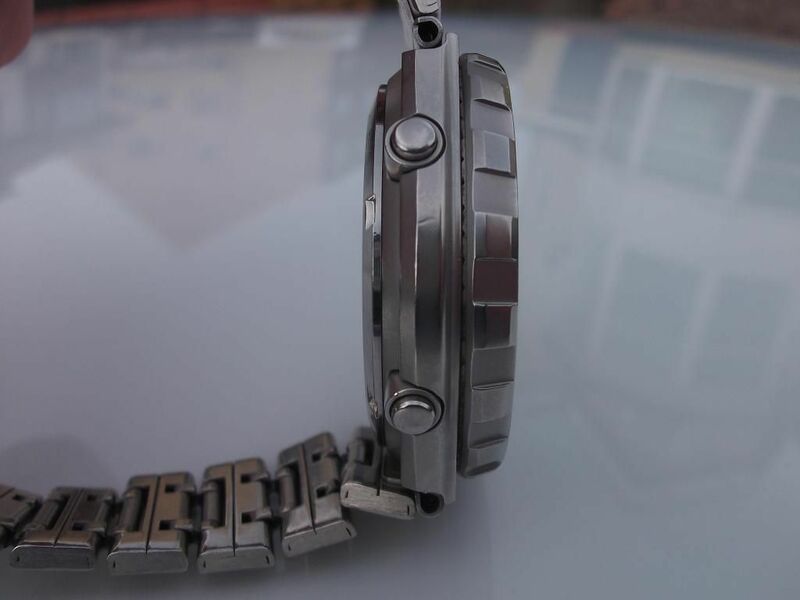 Bi-directional 60-click bezel, with distinctive castellated finger grips. Black moulded acrylic resin bezel insert with conventional 'Diver' minute scale: ▽ 5,10,15,20,25,30,35,40,45,50,55 printed in Orange. 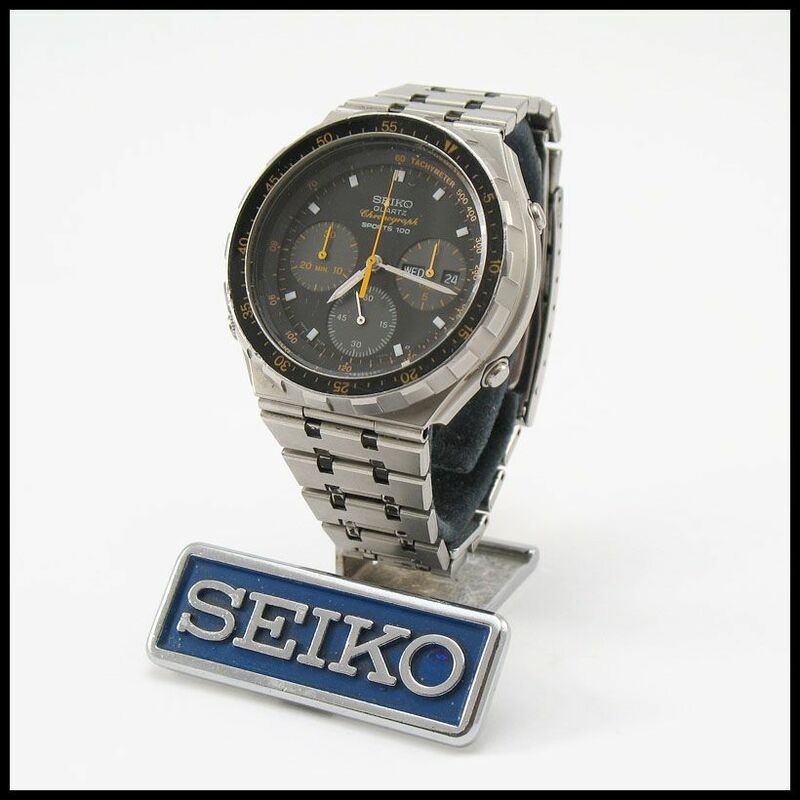 Dial: Part number is 7A38707LX983. 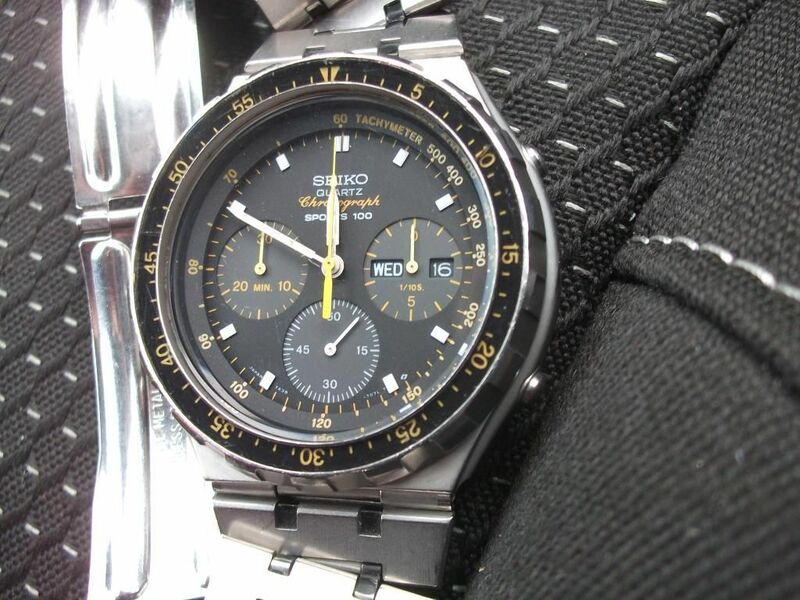 Seiko's database strangely doesn't show any dial colour, but the main dial colour is matt black with dark grey sub-dials. Dial printing is a mixture of mainly bright Orange (or at least it was originally) and silvery-white. 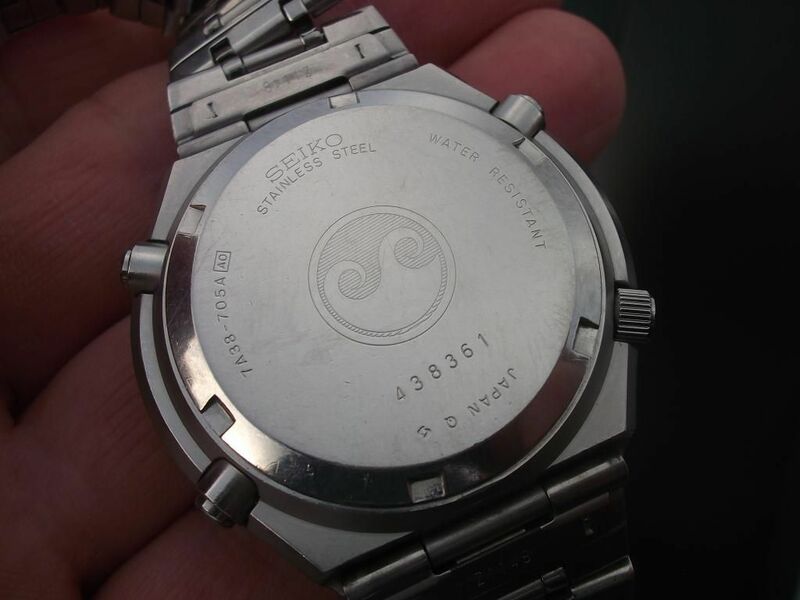 Dial markings: SEIKO (printed logo) QUARTZ Chronograph SPORTS 100; at bottom JAPAN 7A38 707L T Suwa symbol. The matching matt black plastic Tachymeter ring is printed in Orange. Day and Date wheels: White lettering on black background. Second languages seen include: French, German and Spanish. 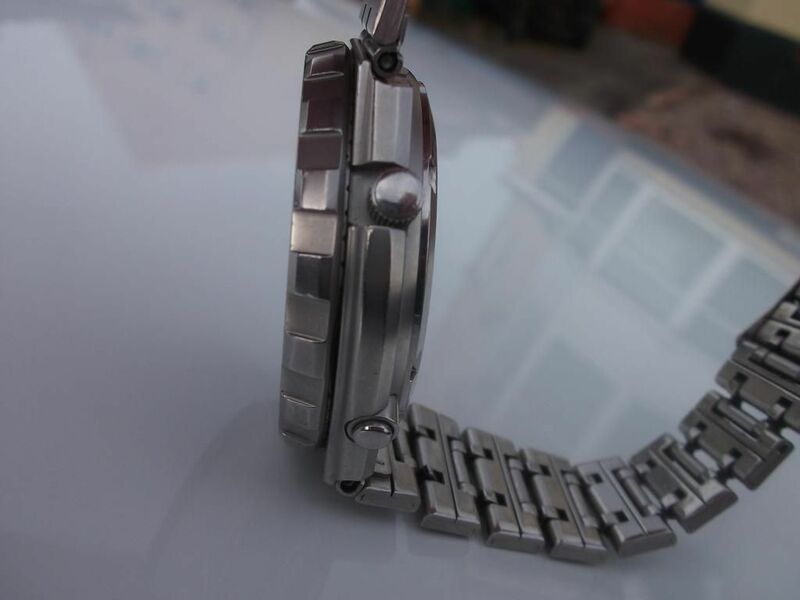 Hands: Hour and Minute hands are Silver (with lume). 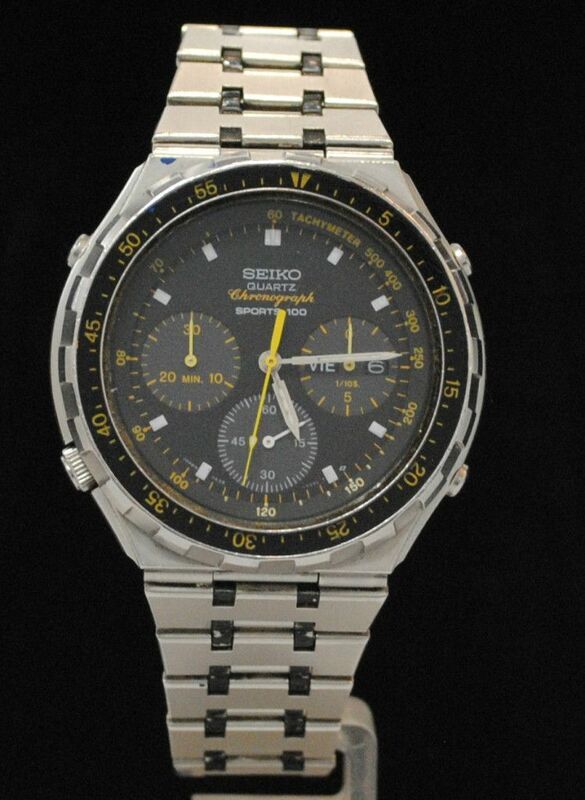 Constant seconds hand is silvery white; chronograph hands are Orange. 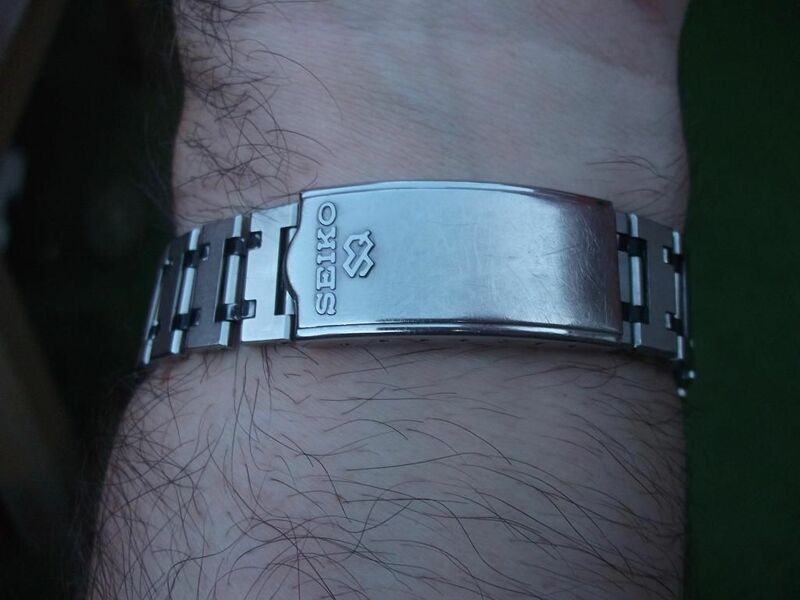 Seiko crystal p/n: 315W20GN00 - 31.5mm Ø x 2.50mm thick, flat with a polished bevel edge - Obsolete NLA; no exact replacement substitute identified as yet, but there are various 31.5mm Ø x 2.5mm crystals which could be fitted as a 'stop gap', for example: Seiko p/n 315P15HN02 as used in the SKX007 (7S26-0020) Diver. However the difference in size of their polished bevel edges is noticeable. 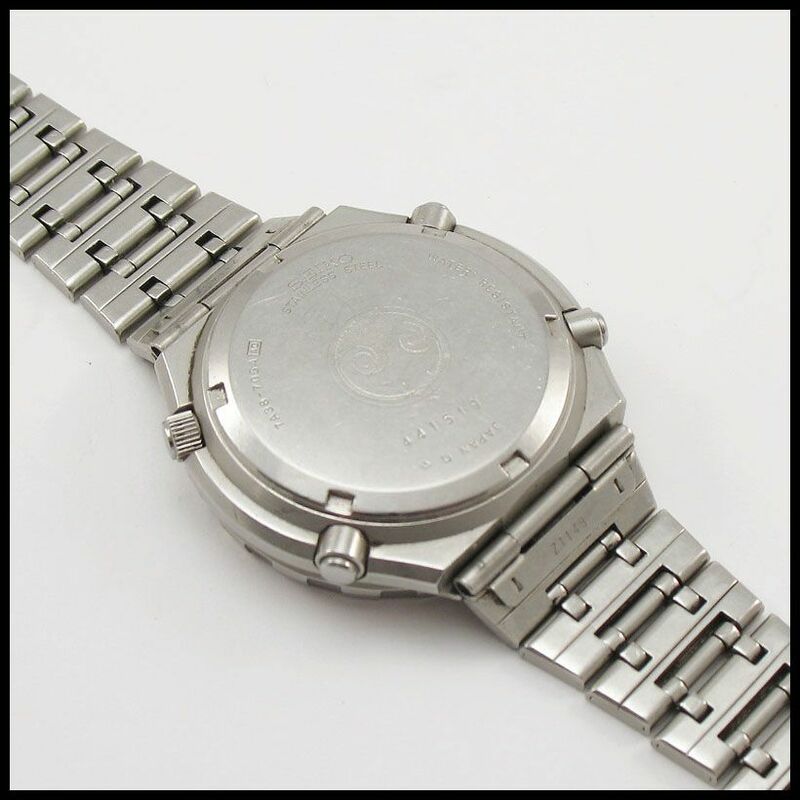 Case-back markings: Double Wave Caseback; 7A38-705A [A0] SEIKO; STAINLESS STEEL; WATER RESISTANT; JAPAN Q.
Bracelet is Seiko p/n Z1148S. Underside of joining links are stamped Z1148. Silver anodized with black painted interconnecting links. The bracelet tapers from 23mm to 16mm at the clasp. Adjustment links are retained by / pivot on 0.9mm diameter split pins. 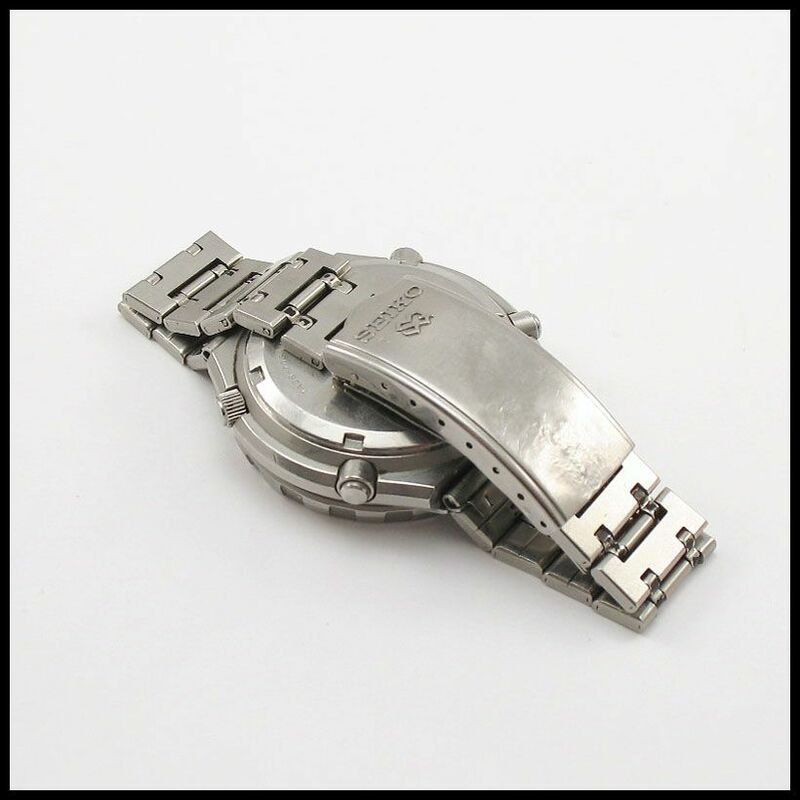 Bracelet to watch case fixings are by Pin and Tube, Seiko part numbers 81601169 and 81180109. 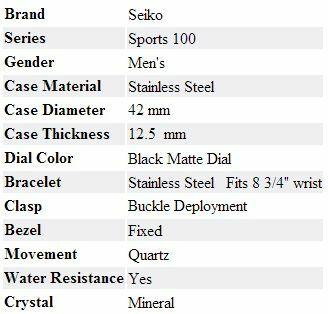 Bracelet is fitted with the period standard 7-hole adjustable Z-fold type clasp, measuring 35mm x 16mm; cover stamped Seiko SQ. Production dates: Serial numbers usually seen are 43xxxx or 44xxxx - March and April, 1984 and one with 51xxxx - January 1985. Geography: Nominally a world-wide export model, sightings of the 7A38-705A are more globally distributed than the 7A38-7050. 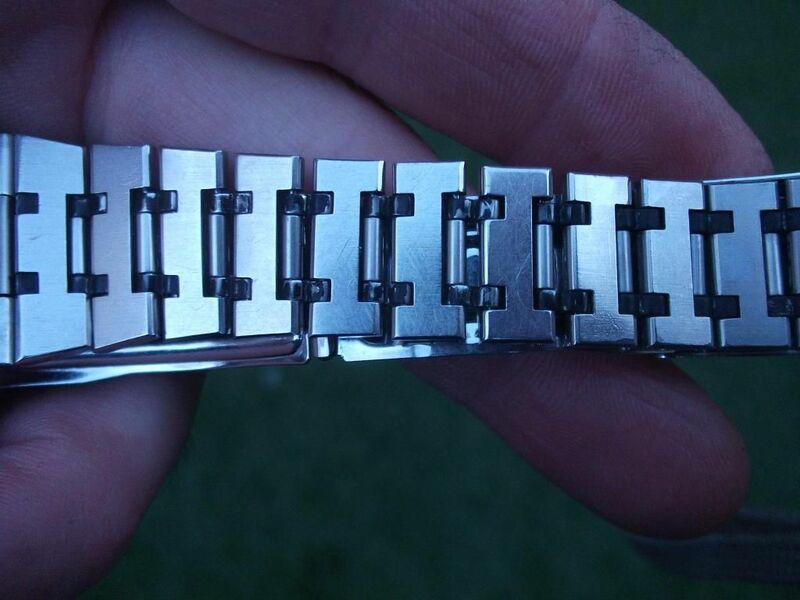 The Z1148S bracelet used on the 7A38-705A (and 7A38-7050) is the weakest link. The main link sections are quite sustantial, but the small black interconnecting links, apart from losing their black paint very easily, are very prone to stretching, twisting and opening out. 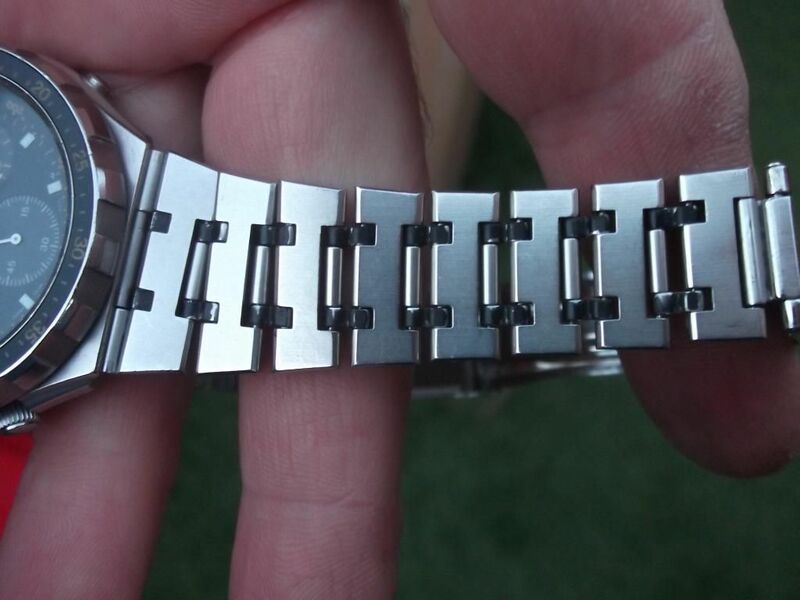 Like many other bluff-ended case designs, the sharp corners on the upper ends ot the watch case are vulnerable to knocks. 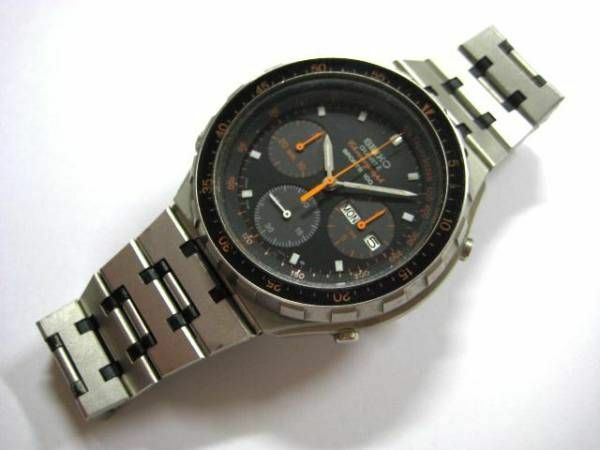 Unlike its 'Peppermint Green' 7A38-7050 sibling, the original Orange bezel inlay colours, chronograph hands and dial printing of the 7A38-705A appear very prone to fading with age and exposure to sunlight. 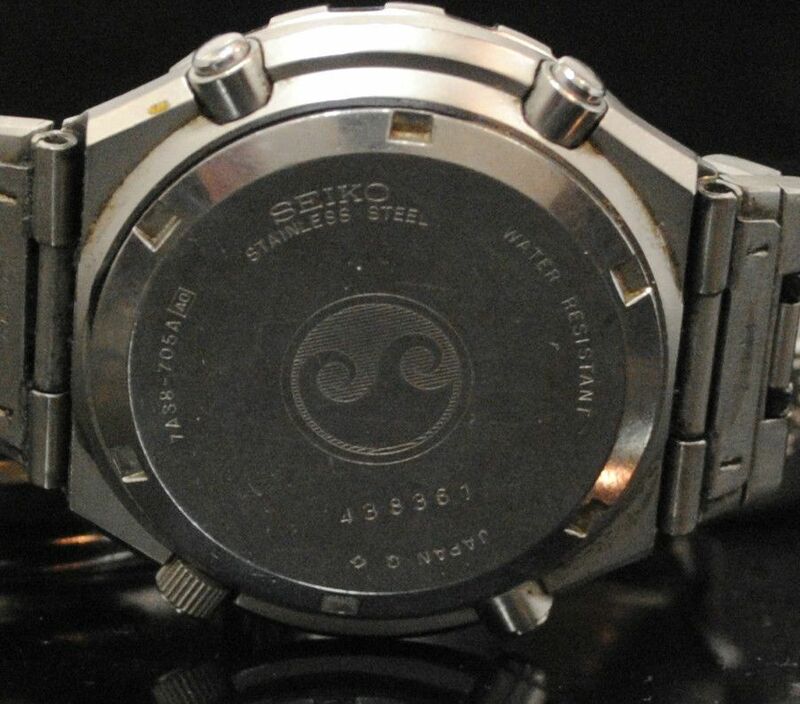 Indeed, as with the 7A38-6020 diver, both versions of which use a similar acrylic resin insert, in the worst cases, the bezel lettering can actually be faded to white. It's not unusual to see used examples where the dial printing and hands have faded, sometimes unevenly, to a pale yellow. Price Guide: $150 - $550 dependant upon condition. Rarity Factor: 4/5 - Very Hard To Find (in good condition). hi all some more photos of the watch. The stiff buttons is a simple fix (assuming no corrosion inside or badly bent pushers). 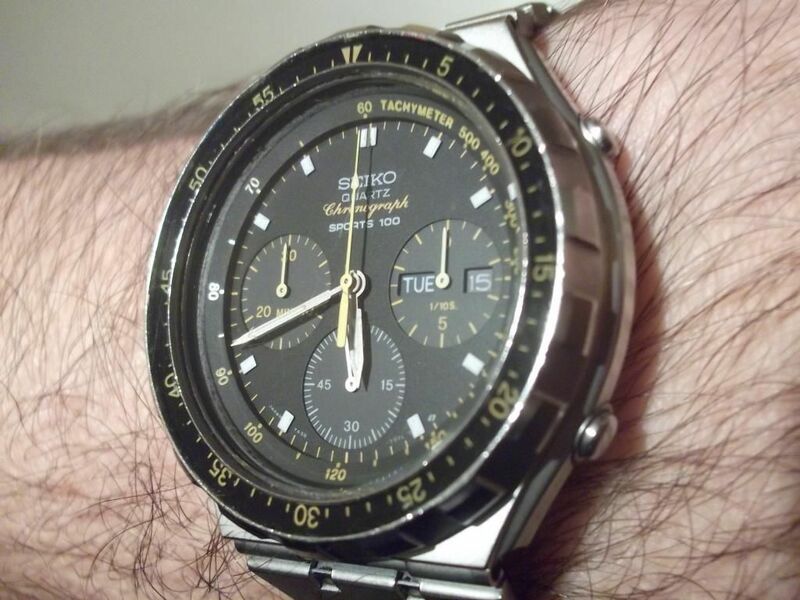 The jittery chrono hand, in my experience is not (necessarily). 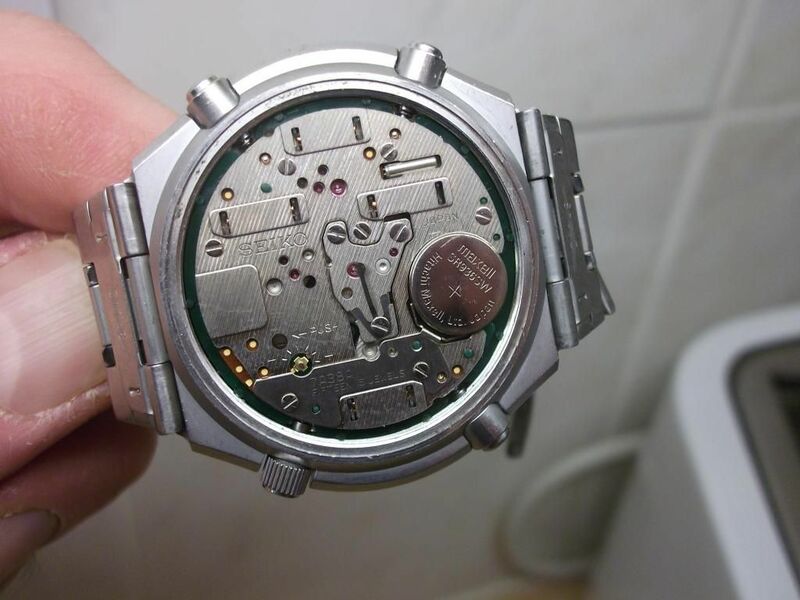 I think for a real watchmaker, someone who can strip the movement down, diagnose and replace whatever parts might be faulty (assuming they can source them), then this would be simple. The 7Axx movement is a real pleasure to work on. However, that's not me!!! I'm just a 'tinkerer' and I've only been doing it for a year or so. If you look in some of the posts I've made, I have done a lot of strip downs with a pretty good success rate. However, the jittery hand syndrome is not one I have a guaranteed solution to. What I've been doing (where I've got a great condition watch externally) if I can't fix it, is to swap the movement from a donor watch. This is relatively simple - a dial and hands swap. But, of course you need a donor movement that is known to be good. I'll take a look at it if you want, and see what I can do. But it might be that you'll need to source a donor movement. Simon. May I add that the pusher buttons on the 7A38-7050 / -705x don't actually work quite as well on as on some other models. Perhaps it's a design flaw, but if you look at the photos on the previous page you'll see they don't protude very far outside their cups. I experimented with fitting (and then removing) the small stainless washers on one of my 7A38-7050's. Two of the pusher shafts were also bent (right at their extreme ends where the circlips fit) too - a sign that a previous owner had been a little too firm with them.